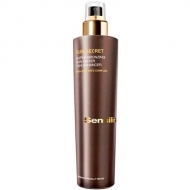 DESCRIPTION: Sun Secret Water Gel After Sun from Sensilis is a lightweight innovative emulsion Water Gel that prolongs the tan and gives the skin a soothing, refreshing and moisturizing effect after sun exposure. With DNA Safe Complex that maintains the beauty of your skin and ensures its protection. Helps maintain a lasting and uniform tan. Rapid absorption texture that provides a feeling of freshness immediately after application.